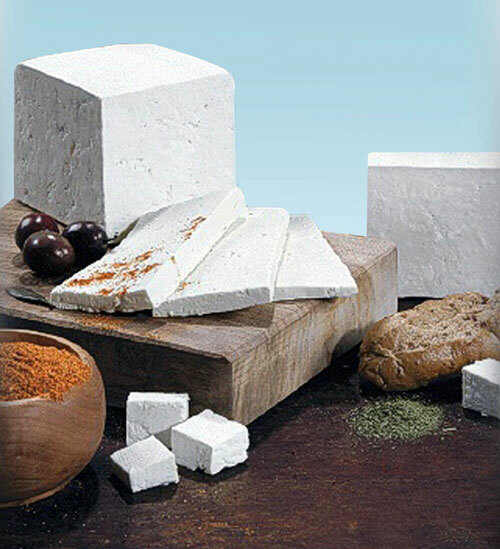 The product “FETA CHEESE P.D.O.”, which is produced in Galatista of Chalkidiki is widely known both among the Greek consumers and consumers in many European countries. Our company processes annually 14,000 tons of goat and sheep milk in its production factory in Galatista of Chalkidiki, and it produces approximately 3,000 tons of final product, which is supplied in the Greek and the European market, repackaged in vacuum in packages of 200gr., 400gr., 800gr., 900gr., and 1.000gr. Moreover it is also marketed in many different plastic packages, i.e. Tupper, in brine of 150gr., 200gr., 400gr. 800gr., 900gr., one kilo, two kilos, eight kilos, and fifteen kilos, as well as in metal tinplate containers, either with labels having our company’s details, or as a private label product following special agreement with each customer. For the repackaging and packaging of our products in plastic containers (Tupper in brine) our company has bought additional equipment over the last years so as to further ensure the product packaging quality. In particular, cheese packaging in plastic containers (Tupper) is now carried out using automatic heat-sealing machines. After filling the containers with brine, the plastic containers are sealed using a special film. This machine type was designed using innovative technologies in order to ensure greater effectiveness and higher quality during the repackaging process.